In his illumination on the eighth verse of Sri Upadesamrta, Srila Sridhara Maharaja discusses faith in relation to what faith is and what it is not. This is the Vedic process of learning. When you learn about something you must also understand what it is not. Take gold for example – when you learn what are the qualities of gold, you must also learn what is not gold. Learning what is not gold is sometimes more important than learning what gold is, because you must also be able to identify imitation gold. The same goes for silk – what are the qualities of silk? It is smooth and it has a certain shine to it. In the market a shopkeeper may say that a sari is silk but actually it may be nylon, orlon, dacron – anything but silk! How do you identify silk? If you have a very keen eye you can identify silk. You must pull a small thread from the sari, burn it and then smell it. If it has a very organic and natural smell then it is silk. If it smells like burning plastic it is not silk. Similarly, you cannot know sandalwood by smelling it. You have to taste it. Therefore you should know what a thing is not, otherwise you will be cheated. In the book The Loving Search For The Lost Servant, Srila Sridhara Maharaja discusses faith in a very complete way. The Loving Search For The Lost Servant is actually a thesis on faith, the subtlest thing in our experience. Srila Sridhara Maharaja explains what is faith (sraddha), what is not faith and how valuable it is to us in our search for Krsna. Faith is the most valuable thing we have. But in his commentary it is mentioned that faith is not a product of the mind. When you believe in something, usually that is a product of the mind. Generally sraddha is translated as belief. Somebody may ask, “Do you believe in Krsna?” We may reply that we believe in Krsna, but belief is in the brain – it is a mental process of accepting and rejecting. Sraddha is on a subtler plane than that and it takes place as a confirmation in the heart or the soul that reality exists and that reality is Krsna. It is a confirmation of that which is beyond matter and that which itself is not material. Matter cannot confirm what is beyond matter. Only spiritual substance can confirm Krsna. Srila Sridhara Maharaja was once offered LSD, and he was told the glories of LSD and how it is supposed to uplift one’s consciousness. The people who were telling him this were so foolish that they offered him some hallucinogenic drugs. He had been telling them that no amount of maya could produce Krsna; no amount of matter produces a spiritual substance. In other words, life does not come from matter. Matter is dead, and no amount of matter gives birth to life. Life is living force. Matter never comes to life. Life is an independent subject. It is an independent entity, an independent spiritual substance. Sridhara Maharaja said that no amount of darkness produces light and no amount of ignorance produces knowledge. He used to laugh at the idea that you can get eleven ignorant fellows in a room and have a vote on something and come up with the right solution. That is impossible. And it is not that if you add just one more ignorant fellow then you will get it right. That is what is wrong with the world today – ignorant people, who don’t understand what is the goal of life, run everything. Sometimes there are people who know what the goal of life is, but they are not experts in the science of Krsna Consciousness. People gather to make resolutions. Prabhupada used to say, “Resolution, revolution, dissolution, no solution.” This is the problem. Look around the world! They have meetings, they resolve, pass laws and after a while people are shouting in the streets with placards, then some of them go up into the hills and start shooting at people. This is going on all over the world, because they don’t know what is the purpose of life and how to achieve it. No amount of ignorance produces light – even great thinkers like Einstein died in ignorance because their knowledge was only on the mental plane. Real knowledge is described as that which explains the difference between matter and spirit. It doesn’t matter how advanced one is in any particular field of modern science or cultural science if you don’t know the difference between the body and the soul. That is where knowledge begins. Einstein did not clearly understand this. Through some of the statements that he made we may assume that he had some intuition towards it, but he had no clear definitive understanding and therefore one of the greatest brains of the modern world died in ignorance. When Einstein died, the secret service locked down his house and confiscated everything in it. Gradually they released everything and returned it to his family, but they kept all his papers because he may have been working on some cutting edge theory. At that time, a friend of my father was in the FBI and he went to Einstein’s house. He had a camera and he took a picture of his desk and somehow or other, this photograph came to my father. About 15 years ago I went to pay him a visit and he showed me this picture and told me that this was a photo of Einstein’s desk just after he died. There were pens, papers and different things on it and there was something else lying there on the right-hand corner of Einstein’s desk. It was a book but with the naked eye I couldn’t see the title. I took a magnifying glass and found that the book was called The Philosophies of India. So he didn’t die in total ignorance, but he was on the path. On the other hand, as you know, Einstein was not sane. He was a womanizer and a heavy smoker, but he had a hyper brain. Einstein’s knowledge was on the physical plane, that which is actually just a minute aspect of life. Powerful knowledge is spiritual knowledge. The body grows around the soul, not the soul around the body. This ‘thing’ that cannot be traced is smaller than an atom but has managed to produce something the size of an elephants body, a dinosaurs body, a whales body or a timingila’s body. Yet the soul cannot be found with any material instrument. Its presence is understood by its symptoms and life is one of them. Here, Srila Sridhara Maharaja says, “Imitation is not success, rather imitation degrades.” For example, a lawyer of a certain status will have the respect of the law board, but if he imitates a judge he will lose his status as a lawyer also. He will be degraded and will be removed from the bar. Imitation is a type of a fraud. Fraud produces some gain but that is all in the cheating business. When that fraud is discovered, it degrades. Sridhara Maharaja is saying that in the philosophy of life, in spiritual life, imitation degrades. Then he says, “Mind is another thing, but the mind is not faith or sraddha. Faith, sraddha, is connected to the soul and the mind is connected to matter.” The mind and this table in front of me are the same because they belong to the eight material elements – earth, water, fire air, ether, mind, intelligence, and false ego. These are material elements and our body is comprised of them. We accept that water is a part of our body. There is also fire in the body – if your temperature goes beyond 107 you die and if it goes below 95 you die. There are stories of some people who have spontaneously combusted. These may just be rumors, but we find in the Bhagavatam that Sati sat down in meditation and her body exploded into fire because of Daksa’s insults to her husband, Siva. She couldn’t tolerate it so she sat down and burned herself in the fire of mystic yoga. Fire is in the body and as we know fire is a material element. “Ashes to ashes, dust to dust.” Dust to dust means that the body is made of dust – ashes if you cremate it, dust if it is buried and stool if it is eaten by the animals. That is what happens to every physical human body in the world. This is the ultimate fate of the body. It comes from material nature and it goes back into the material nature. But the soul is something different and sraddha comes to help the soul. Knowledge comes to help the mind. Bhakti-jnana is spiritual knowledge. Where does it enter? It enters into the mind and it enables us to control the mind, control the senses and then surrender the material elements of this body into the process of devotional service to Krsna. At a point, knowledge says, “I have done my job” and bhakti goes on and doesn’t require any knowledge. Knowledge retires. In the beginning knowledge is very important. You can’t simply say, “I am going to perform bhakti based solely on my faith.” You have to have a proper understanding. Proper understanding means that first you don’t have any misunderstanding. Some devotees don’t have any standing on a particular understanding. That is tolerable. There are many things that I have talked about for years, but because of the language barrier some of our devotees don’t understand. They don’t have any misunderstandings, therefore they have proper knowledge. Vidya means knowledge and avidya means ignorance. A hundred years ago a man that could fix a car had the same social status as an I.T. student in India today, because at that time the car was a very advanced machine. That is material knowledge. Material knowledge itself is actually avidya. Real knowledge is spiritual. That is real jnana and it is identified as bhakti-jnana, atma-jnana and tattva-jnana. These are all Sanskrit words referring to knowledge that is beyond matter. This type of knowledge can save us from misconceptions, because if misconceptions are there then bhakti goes on in the wrong way. We may go on performing bhakti for a long time, but in the end it doesn’t produce the fruit of love. Knowledge is there to eliminate misconceptions and guide us on the right path so that our sraddha increases. Sraddha is the investment of Radharani in the jiva. That is true because Her name is Sraddha Devi. She is Bhakti-devi and she is Sraddha-devi. Faith comes from Radharani. She has the most complete faith in Krsna, more so than any other entity in existence. She is the ultimate. Anyone who has faith in Krsna should know that it comes from Radharani. But if someone says, “I believe in Jehovah” or “I believe in Allah” – that ‘faith’ doesn’t come from Radharani. That is on the mental plane. That is not sraddha. Sraddha doesn’t go anywhere except to Krsna. Sraddha comes from the spiritual world. It transcends matter and it is an experience that confirms reality and ultimately encourages us towards surrendering to Krsna. Faith in these other religions is based upon the modes of material nature. These religions are known as the religions of the Yavanas and Mlecchas. The Mlecchas were originally performers of human sacrifice and the Yavanas were degraded ksatriyas of the Vedic civilization. These religions are not transcendental. They may carry some information – some plane of well-being and goodness in them – but they don’t cross over the material world into the transcendental world. In fact, the initial understanding amongst the Jews was that they will inherit the earth. The earth was the prize – not heaven. Christians created Heaven hundreds of years later. Jews don’t go to heaven, Jews inherit the earth and even some Christians thought the same way for hundreds of years. These religions are not about transcending the material world and ascending to some other plane of existence. That idea entered through Gnosticism, a religion that had connections with ancient India and Persia. The basis of the Abrahamic religions is that God made the earth and that is what we get – not some other place. But Krsna consciousness has always seen the earth as a temporary home, like a transit lounge in an airport. Don’t try to get too comfortable! Take advantage of the facilities, but don’t try to live here. The world has many advantages and many wonderful things – but be careful! Behind that wonder lurks a danger. Jivo jivasya jivanam. These other religions don’t cross over the world of matter into the transcendental realm. Transcendence is unidentifiable by the mind or even the intelligence. Although you can get very close with the intelligence, ultimately intelligence is only matter. Transcendence is purely spiritual. Intelligence can suggest something is there. Your intelligence may say that there is intelligence behind this universe, but intelligence cannot understand transcendence, because intelligence is a material element. That which confirms transcendence is faith. Transcendence is beyond the physical, mental, and intellectual experience, and faith confirms its reality. The mind and intelligence only suspect its reality. They cannot verify this reality. Now, my faith can’t verify Krsna to somebody else. That is not what faith is for. Faith verifies reality for you. Initially, the strongest proof you have is that it says so in the Vedas – but it says something else in the Bible and in the Koran. What it says in a book is not final. Ultimately, knowing is an inner reality of realization and it is the realizations of sages that is written in the books. The books explain the experience of the sages in the plane of faith and they try to direct us towards that experience through faith. 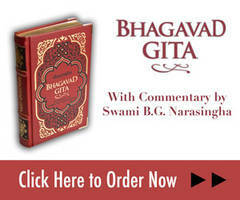 The Bhagavad-gita describes faith in the modes of nature and then describes the transcendental plane of visuddha-sattva. That is where real sraddha is found. Faith transcends mundane reality – faith confirms the Absolute.